For whatever reason, one of our macs didn't make a recovery partition when it upgraded to Lion. Is it possible to add a recovery partition after the fact? To be clear - on a normal mac, the recovery partition is hidden in both the Startup Disk system preference and the Disk Utility. You can only see it from the command line with a direct command, diskutil list or enabling the debug menu in Disk Utility. It also shows up if you boot with the option key held or if you successfully boot to recovery with Command-R a.k.a. ⌘+R during boot. Warning - this question and answer ONLY APPLY to 10.7.x Lion - using the Lion installer to recreate recovery on newer OS can and will cause problems due to drivers not being present for newer OS and hardware. Rerunning the Installer works for OS X 10.7, 10.8 and 10.9 - running the recovery disk assistant isn't a good idea if you are running 10.8 or newer OS as well as hardware that ships with newer builds of OS. 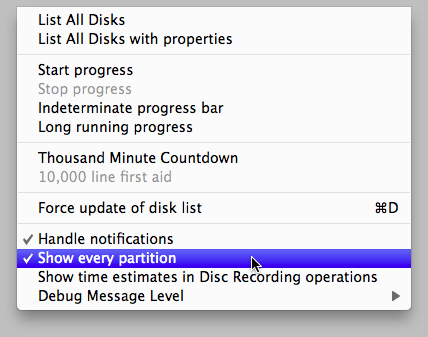 The Lion Recovery Disk Assistant can make a backup copy of the recovery partition. The Lion Recovery Disk Assistant lets you create Lion Recovery on an external drive that has the same capabilities and limitations as the built-in Lion Recovery. Just as a backup copy of a good file needs to be made before the file comes upon it's demise, this tool will not help if you start with a partition that is missing or broken. 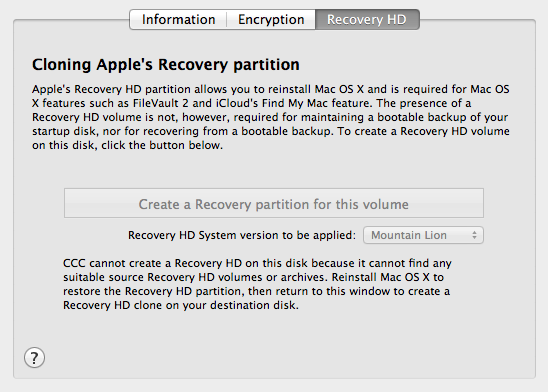 Re-running the Lion installer will create a workable recovery partition. To get the Installer (since we didn't save it and it deletes itself on running the first time). Start the App store and pick any view except Purchased. Hold the option key while selecting Purchased. It took a good 35 minutes to run the installer again. Disk Utility hides the Recovery HD (and other partitions by default) unless you enable a debug menu. You can use the diskutil list to see the Recovery HD if you don't mind terminal.app commands. The debug menu looks as follows - selecting show every partition will let you see whether your Recovery HD is on your drive. I don't know if you can move a Recovery HD around like a normal partition or need the other defaults write command to roll your own recovery HD, running the Lion installer a second time was fine for my needs. As many have pointed out, it appears that the recovery contents are not universal and instead customized for the specific hardware, so recreating it from the official tools is much preferred unless you wish to test well and are saving time by automating tens or hundreds of macs and can control for hardware differences in your process. It took about two hours, and after that I had a working recovery partition again. Reinstalling OS X over an existing installation is similar to upgrading to a new major version of OS X, or it keeps user files and settings in place but replaces system files with new versions. Apple should call it something less scary like "repairing OS X", because it is the solution to a lot of issues like this, and it is not such a drastic operation especially if you have backups. Upgrading to a new major version of OS X will also add a missing recovery partition. While all of the solutions outlined in this discussion will probably work, if you're using the latest version of OS X someone was kind enough to create an AppleScript that does the entire process automatically without having to run any commands from your terminal or trying to carefully manage system partitions. I've tested it out on Mavericks (10.9.4) and it worked great. After running the tool, I was able to enable FileVault 2 which previously refused to activate because my machine was missing a recovery partition. Click Window -> Disk Center. In Disk Center, click the Recovery HD tab. Click "Create a Recovery partition for this volume". Nice article above and reminds me to create an image of recovery partition as well as a backup. then back to disk utility and re-installed OSx from DVD to Macintosh HD partition. I apologize if I've misunderstood or perhaps not followed your guidelines with respect to providing an answer so if I get booted out I understand, however I believe information I obtained from your forum brought my iMac back from the brink and wanted to express my appreciation about what I've learned here. In short, my 2011 27" iMac running 10.7 lost its recovery partition and whether its necessary for one to be in place to perform a clean install of Lion over the Internet I will leave for the gurus and experts to decide... all I know is that while I was smart enough to back-up my data ( and on two different drives ) for such a possibility as a total and complete crash of my newest Mac, repeated restores from my Time Machine back up drives brought it back... but only momentarily. I've been a Mac user since the 1980s. My first Apple was a brand new Black & White Mac Classic. Always able to install an OS using discs which were bundled with my Macs ( that rarely misbehaved ) I was a little more than freaked out to learn that's all changed with newer Macs which is to say all I had to go on were my Time Machine drives, trusting that the OS would be put to rights via a complete restore, however not until I recreated a Lion recovery partition on the drive was I able to perform a clean OS install, again, over the Internet. My iMac returned to life just yesterday morning after numerous failed attempts to bring it back and only after a clean install of 10.7 Lion. I don't know what the underlying cause of the crash was, I probably never will, but I do know I am grateful for forums like this ( where I've spent seemingly countless hours over the past week or so ) because without the information I've gleaned here my 3 year old iMac would most likely have become a lawn ornament. Chances are I would also be replacing some window glass after throwing my iMac through it out onto the lawn and while I may have felt better for a fleeting moment or two... my Mac wouldn't be fixed so tossing it wasn't an option. Are you sure it's not there? The recovery partition doesn't show up in disk utility, to view it you have to reboot and press option (alt) to get a list or drives you can boot from and you should have one called Recovery HD or if you want to access it directly just press Command-R at startup. Not the answer you're looking for? Browse other questions tagged lion recovery . How to create (the missing) El Captain recovery partition? How to recreate Lion Recovery HD partition? How can I create a Lion USB recovery stick without Mac OS? How can I Create a Recovery Partition on a Newly Installed SSD? Why is my boot partition listed as Unmounted in Disk Utility? How can I resize my Lion partition to fill up the unused space on the drive? How to resolve error: “Couldn't modify partition map because file system verification failed”? How do I know if I have the Lion recovery partition set up? Lion Recovery Terminal will not allow me to run TestDisk? How to fix a broken recovery partition (remove it) when repairing it is not possible?